I have found that I am stamping more when I enter a Challenge, which means I have more to share with you! Let's get started. Ink wood "slice"? stamp in Blackberry Bliss, stamp off twice and onto WW scrap. 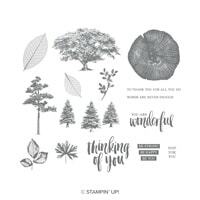 Stamp "... wonderful" greeting in Versamark on top and emboss with silver embossing powder. Die cut embossed piece with third smallest oval Framelit (roughly 2-1/4 x 1-1/4). Ink tall tree stamp in Blackberry Bliss and stamp off once then onto WW 3-1/2 x 1-7/8 piece, centering horizontally (as shown). Stamp tree again, without reinking for tree in background and again, without reinking, for another background tree. If you need to reink for last tree, do so and stamp off three times, first. Adhere DSP and WW onto Blackberry Bliss mats. Adhere DSP section to base a little off center horizontally. Pop up narrow WW piece with trees on Dimensionals. Add oval piece with Dimensionals (and a Glue Dot where ir overlaps the trees layer. Add Silver Leaf Trinket where desired.